Split the children into teams, set up a table somewhere in your meeting space on which you should place envelopes (or just sheets of paper) with different addresses on e.g. School, Bank, Butchers, Dentist etc. Around the meeting space place post boxes with corresponding addresses, you could use chairs with an open back for this or just use boxes. One at a time each member of the team must pick up a letter and post it into the correct post box before running back to tag the next person in the team. The winners are the team who deliver all their post first. 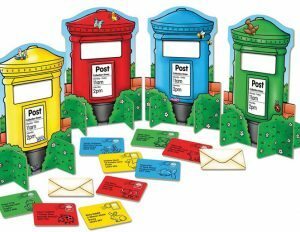 You can purchase a ready-made game made by Orchard Toys ‘Post Box Game’ to use to play, buy online from Amazon or also available from most toy shops/supermarkets.